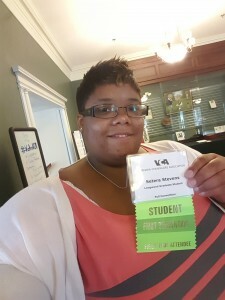 I signed up as a volunteer at the VCA convention, because I wanted an opportunity to meet ANYONE I could. Well that and I love working, I honestly can’t sit still. My classmate and I started our journey to The Homestead after a riveting lecture on the DSM 5! The drive up added meaning to the song “over hills and through the woods”. However, we made it safely to the hotel and welcomed the jaw dropping view. Eagerly, I hit my alarm at 6:15 a.m. to get ready for a day. I headed downstairs to meet a nice older gentlemen, who quickly shows me “the ropes”. In no time I was checking people in, before heading to a 7:30 morning mediation session. For people who know me, sitting quietly is hard. My mind goes a thousand miles per hour and I’m already thinking about what to do next after I write this blog! Even though I struggled in morning mediation, I did learn to “touch my thought”. The instructor told us that it will take some work to meditate, but if you acknowledge the thought (touch it) and move on, you won’t be tied down by it. I know that he meant for us to use it for medication, however I am using it in my day to day interactions. Instead of letting negative thoughts or feelings control my day, I acknowledge the thought/feeling and let it go. After breakfast, I head back up to the registration table to help out until Professor Doyle’s presentation. His presentation was on Interdisciplinary Teamwork, specifically the counselor and the lawyer relationship. I also attending Professor Wynne’s presentation on The Power of Peers: Utilizing Students in Classroom Guidance Delivery. She also talked about using interdisciplinary teamwork, not with regard to the student, but in regard to working with teachers. However, now that I think about it, the students added a level of teamwork as well. Both of our Longwood professors did an excellent job and had great turnout! #golongwood I spent the rest of my afternoon in Relationship 101 and I am not Jason, I’m Jessica. They both were very interesting and I learned a lot. I was not for sure what to expect from my first conference, but what I did learn is to get back to the basics. We all have busy lives and are sometimes forgetful of the small things. Some of us over-analyze, when all we really need to do is stop, take a deep breath and go back to what we know. I feel that conferences can be a place for you to learn new knowledge, catch up with your past, refocus your future and leave ready to fight another day. Maybe that is an overly optimistic viewpoint, but it’s what I took from the whole process. Since I am still working on my basics in Counseling, I will take what I learned and continue studying. This entry was posted by Setera Stevens on November 20, 2015 at 4:35 pm, and is filed under 2015-2016, Counselor Education. Follow any responses to this post through RSS 2.0. Both comments and pings are currently closed.